There are rock shows, and then there are experiences. Bernard is one such band who strive to create enigmatic, environmental soundscapes that wrap the listeners up in a cacoon of stimuli and carry them to another place. By utilizing strings, laptop, and visual accompaniment to the standard rock formula of guitar, drums, vocals, and bass, Bernard seek to make their live show all about the atmosphere of experience. Citing Bjork, Mogwai, My Bloody Valentine, and Brian Eno as influences, Bernard has been touring the nation consistently since the release of their most recent opus, A View Beyond the Cave. 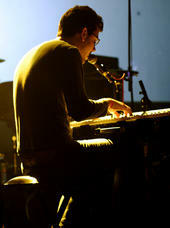 BERNARD has played to a variety of audiences while sharing the stage with: the album leaf, aloha, the appleseed cast, brandtson, cool hand luke, denison witmer, discover america, further seems forever, the helio sequence, joan of arc, lovedrug, mewithoutyou, moments in grace, mute math, neva dinova, number one fan, saxon shore, secret machines, travis morrison (of the dismemberment plan), vedera, and the velvet teen among others.